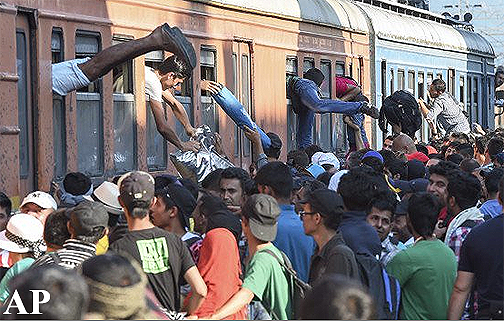 The precarious situation in Greece means that thousands of refugees are making their way to northern Europe. There, the reaction is increasingly panicked: The Bavarian Prime Minister Horst Seehofer has announced plans to fend off refugees with “rigorous measures.” In Germany, there have been several attacks on asylum facilities. In Italy and the Czech Republic, there were demonstrations and riots. On Friday, tumult came to the station from Gevgelija in Macedonia. Thousands of refugees flooded there heading northward due to the unclear situation and the rapidly deteriorating conditions in Greece. 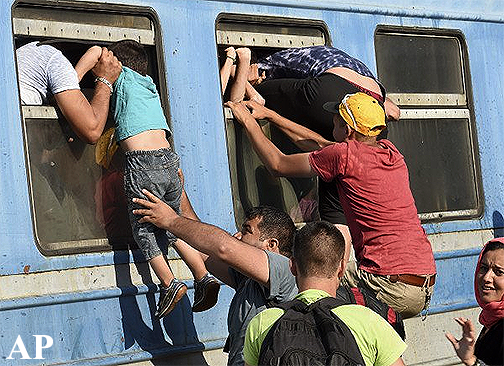 They try to get into the EU via Serbia from Macedonia. On Greek Islands the humanitarian conditions are unbearable. However, on the Greek mainland, refugees at the moment also have little prospect of improvement: The Greek Orthodox Church considers itself unable to cope with them in addition to the problems of their own people. German Economic News is informed that some monasteries have three times as many people to feed than free meals available to feed them. The problem for the monasteries is that they are the first to feel the financial restrictions. Cash is scarce because of the 60-euro limit for withdrawals — therefore in Greece, charities that were always very generous must now set strict priorities. They need the cash for their own families. Social services suffer a noticeable decline in donations, due to the economic crisis. YTD 80,000 migrants already had come to Greece before the crisis. 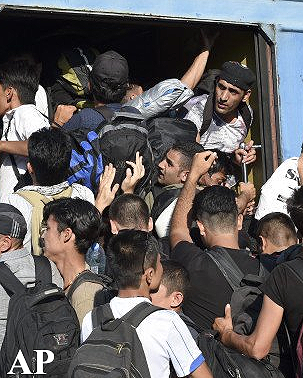 Many were traveling through Greece to other countries, and this continues. “Therefore, we are seeing more and more a movement of refugees from Greece to Macedonia, Bulgaria, Serbia, Hungary and then continuing northward,” Guterres said. The United Nations cooperated with the Greek government in the construction of the asylum system. Support for the refugees should “be the responsibility of the European Union,” Guterres said. Instead, the EU follows, after the rejection of a quota by the Eastern Europeans and France, a different strategy, and prepares for the possible onslaught with defensive measures: Hungary has announced its intention to construct a border fence to prevent refugees from reaching its cities. This has also been proposed in Italy, because the refugees, according to north Italian regional politicians, interfere with tourism [an essential industry there]. On Saturday night, went up in flames in Remchingen (Baden-Württemberg) a vacant former clubhouse, after a remodeling to prepare for refugees to move in during 2016. Early Saturday morning in Lower Franconia Waldaschaff a paper trashcan burned in the garage of a refugee hostel [perhaps lit by locals]. At the time about 18 people were in the house, but no one was injured. The building itself was not damaged. And before that, on Thursday night, unknown person(s) in Bavaria Reichertshofen set fire to two entrances at a building complex, which is planned to house starting in September, 67 asylum seekers. A motorist noticed this fire shortly after midnight. Firefighters then arrived, but already two floors and the roof had burned. In Prague there have been demonstrations for and against immigrants.The news portal Novinky.cz showed around a thousand people signed for a rally organized by the right-wing National Democrats, against immigration, and for separation of the Czech Republic from the European Union. A large contingent of police prevented clashes with hundreds of participants in a demonstration against right-wing extremists which had earlier begun. The protesters fought against the extremists mainly shouting matches, but occasionally there were also minor scuffles.